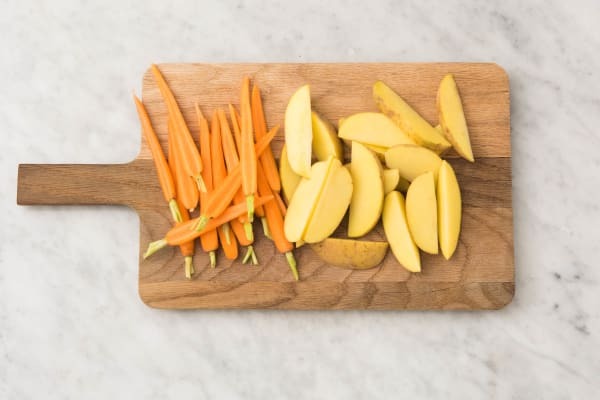 Apples, cranberries, baby carrots, potatoes, onion, and parsley: that’s not a shopping list for your next trip to the produce market. It’s all the fruit and veg bounty that’s in this recipe. 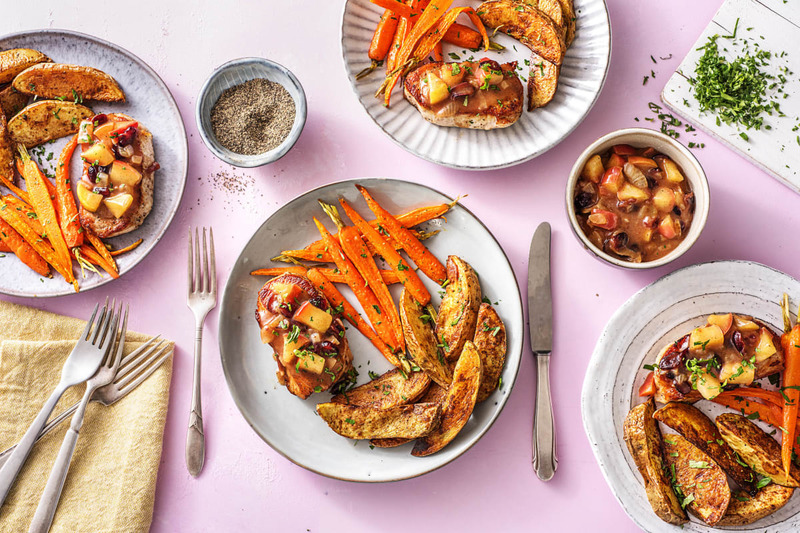 So you can rest assured that your family will get their fill of their five-a-day with this dinner, plus a hearty serving of protein from the succulent, sauce-drizzled pork chops. Wash and dry all produce. Adjust racks to middle and upper positions and preheat oven to 450 degrees. 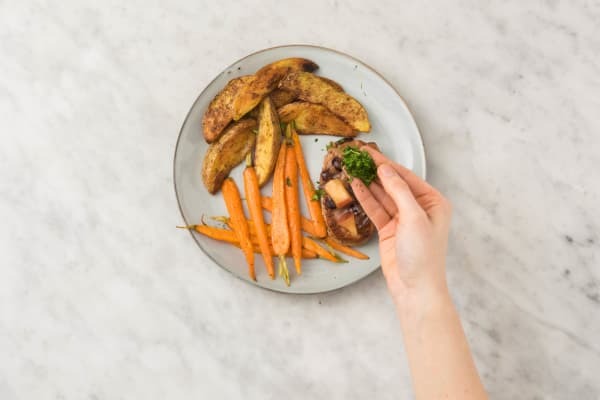 Cut potatoes into ½-inch-thick wedges, like steak fries. Halve carrots lengthwise. Quarter any carrots thicker than ½ inch. Toss potatoes on a baking sheet with a large drizzle of oil, harvest spice, salt, and pepper. 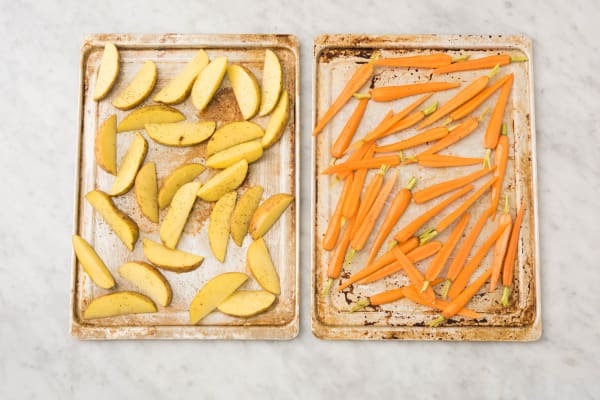 Toss carrots on a second baking sheet with a large drizzle of oil, salt, and pepper. Roast potatoes on upper rack and carrots on middle rack of oven until tender, about 30 minutes for potatoes and 25 minutes for carrots. Meanwhile, pat pork dry with a paper towel and season all over with salt and pepper. Heat a drizzle of oil in a large pan over medium-high heat. Add pork and cook until browned, 4-5 minutes per side. 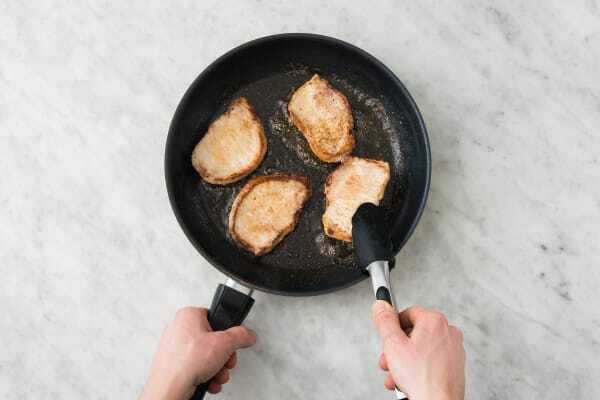 Remove from pan and set aside. 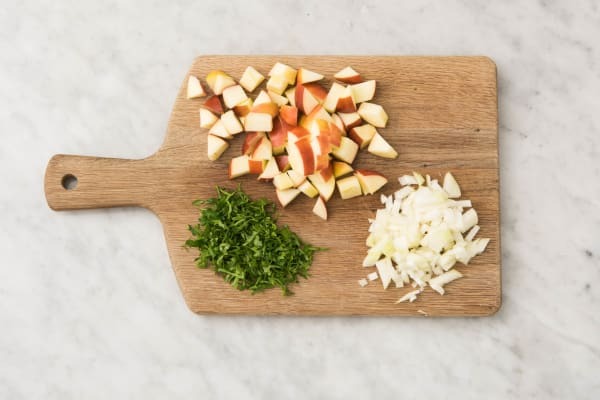 While pork cooks, halve and core apple, then cut into ½-inch cubes. Halve, peel, and dice onion. Finely chop parsley. Once pork is done cooking, lower heat under same empty pan to medium and add onion and 1 TBSP butter. Cook, tossing, until just softened, 2-3 minutes. 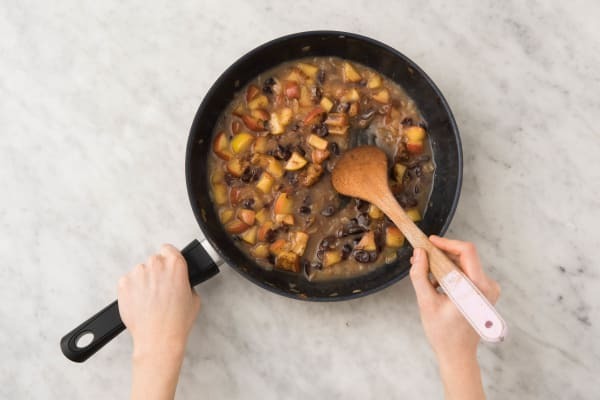 Add apple and cranberries to pan and cook, tossing, until apple begins to soften, 2-3 minutes. Stir in stock concentrates, ½ teaspoon cinnamon (we sent more), and ⅓ cup water. Simmer, stirring, until apples are very tender and mixture has a thick, saucy consistency, about 4 minutes. (TIP: If mixture dries out, stir in a small splash of water.) Season with salt and pepper. Stir any juices released by pork into apple mixture. Divide pork between plates and spoon apple mixture over top. Serve carrots and potatoes to the side. Sprinkle everything with parsley and serve.